Allow me to preface with the fact that I am a major Chelsea Handler fan. I have been for over six years. We all like to claim that we heard our favorite band first or picked up on the newest fad before anyone else but this is one race that I can claim the gold medal. During my sophomore year of college, I wasn't watching very much television. My mornings were consumed with sleeping, my afternoons and evenings at class (if I made it there) and my nights on the town. During this stage of my life, I didn't bond much with the romote control. But there was one particular program that would run very late at night on the E! network. It was one of those shows that would discuss celebrities with color commentary from random talking heads. Most of those talking heads were desperate nobodies but there was one charismatic comedienne who seemed to speak everything that was on my mind. Every time she got some face time on screen, I would laugh out loud. I had to find out who this blonde jokester was. Unfortunately, every time I tried to find out her name, the super was either nonexistent or flashed too quickly for my brain to compute the information. I didn't have a DVR machine so I scrolled through the TV guide listings and arranged a time to catch a reairing of the show (fortunately E! runs its shows frequently). I was finally able to read the super and jot down Chelsea's name. Below her name was her professional title: Author, My Horizontal Life: A Collection of One Night Stands. The title alone sold me. This girl was my new favorite person. The next day, I went directly to Barnes & Noble and bought the book. I read it immediately and have been in love ever since. This was the book that inspired me to write my own essays and be an author. Needless to say, I have a soft spot for Chelsea. I've read all of her books, watch her show regularly and have seen her live. I preordered Lies and received it last month. I read it pretty quickly and have to admit that I wasn't all that impressed. 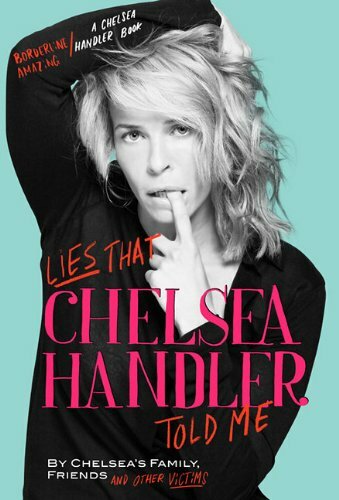 Granted, for the most part, this book wasn't written by Chelsea but by her friends and family. Some stories are better than others and at times it does make for a decent read. But I can't say that I loved it. The book basically tells the story of how Chelsea picks on the people she loves the most. Rather than be pissed or eternally mortified by the lies and pranks that Chelsea pulls, her friends consider it a display of affection. The whole thing reminds me of the playground. The boys who pull your hair are supposedly the ones who like you the most? Twisted logic that often rings true. It can be a bit much to read an entire book about how amazing someone is (even if you think they are as well). But its saving grace is the circle of friends that most of the stories are centered around. This is a group of people that we can all relate to. It's a tight-knit group that you want to be a part of. It's easy to place yourself in these situations and imagine how you might react. For that, it's something I would recommend. The section where she talks about working on a movie with Chelsea based on the Challenger explosion was hilarious. Roy Handler has an amazing sense of humor. His perspective was really interesting to read into. Good comedic timing must run in the Handler gene pool. I love Brad. He's adorably odd. He's got a wicked sense of humor and I appreciate that he can make fun of himself and the situations he ends up in. This story was a lot of fun. Chelsea and her sister are complete opposites. It's amusing to see how they get along. All in all, as Chelsea might say, "Not great," but certainly not too bad either.